There are two types of filmgoers. The minority group are the ones that are more open to different types of films that include experimental films. A few years back I was at the Tate Modern in London with my friend, British director Simon Rumley (one of the 26 directors of THE ABC’S OF DEATH PART 2; THE LIVING AND THE DEAD and the upcoming ONCE UPON A TIME IN LONDON) and we approached an experimental film playing on exhibit. We left after 5 minutes. To my surprise, I thought the experimental film would at least hold the interest of a film director for at least 5 minutes. FAUSTO belongs to the section of Wavelengths, a section at the Toronto Film Festival where one can be sure to be able to get tickets. Films in the Wavelength section usually play to empty auditoriums. Shot on Mexico’s Oaxacan coast, Andrea Bussmann’s (co-director of TALES OF TWO WHO DREAMT) hybrid ethnography is a direct, rigorous, and largely theoretical adaptation of Goethe’s Faust that wholeheartedly adopts that text’s anti-empiricist ideals: it is a portrait of a place and its inhabitants (deceased or otherwise) caught in limbo between what is and what was. In hushed narration, local myths commingle with the Faust narrative, while the images, shot digitally and transferred to 16mm, open onto a pre-colonial world where land and capital were not so synonymous. 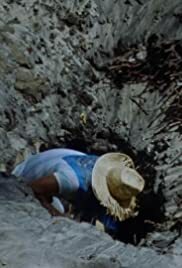 The film is basically story telling, as told by the film’s randomly chosen characters the voices imposed on images, many taken of the Oaxacan coast. The images are impressive but by no means astounding. Quite a few of these images are shot at night and the shadows often cloud the clarity. A few of the stories are interesting – the hidden woods that hide the girl that escapes her marauders at the beginning of creation; the search of the missing shadow of a French journalist by questioning a blind zookeeper; the computers with the black screen in the areas of the black sand that could be due to the iron in the sand and others. Director Gassmann makes no attempt at linking these stories nor even linking some of the images with the voiceover. The film’s pace is incredibly slow with the running time of 70 minutes feeling like a hefty 3 hours. FAUSTO is occasionally pretty look at though it makes little sense most of the time. See this only if you are able to enjoy experimental films or films with little narrative. For myself, I just have so much patience. For critics who love this film, I dare you to recommend the film to your friends. FAUSTO opens at the Bell Lightbox Friday April 12th. The film’s director Andrea Bussmann will be present for an introduction and post-screening Q&A at the Friday, April 12, 6:25pm screening.